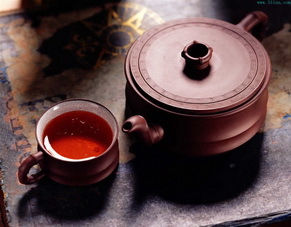 Tea, the most popular beverage for the Chinese, is one of China's specialities and traditional exports. China is the homeland of tea. It is believed that China has tea-shrubs as early as five to six thousand years ago, and human cultivation of tea plants dates back two thousand years. Tea from China, along with her silk and porcelain, began to be known the world over more than a thousand years ago and has since always been an Important Chinese export. At present more than forty countries in the world grow tea with Asian countsies producing 90% of the world's total output. All tea trees in other countries have their origin directly or indirectly in China. The word for lea leaves or tea as a drink in many countries are derivatives from the Chinese character "cha". The Russians call it "cha", which sounds like "chaye" (tea leaves) as it is pronounced in northern China, and the English word "tea" sounds similar to the pronunciation of its counterpart in Xiamen (Amoy). The Japanese character for tea is written exactly the same as it is in Chinese, though pronounced with a slight difference. The habit of tea drinking spread to Japan in the 6th centuty. but it was not introduced to Europe and America till the 17th and I8th centuries. Now the number of tea drinkers in the world is legion and is still on the increase. 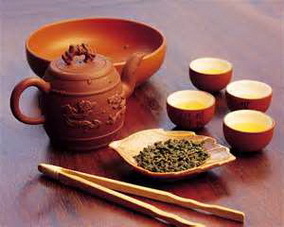 Chinese tea may be classified into five categories according to the different methods which it is processed. 1) Green tea: Green tea is the variety which keeps the original color of the tea leaves without fermentation during processing. 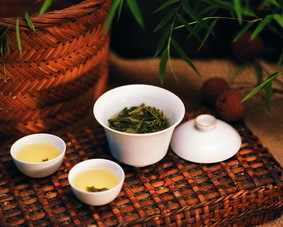 This category consists mainly of Longjing tea of Hangzhou, Maofeng of Huangshan Mountain in Anhui Province and Biluochun produced in Jiangsu. 2) Black tea: Black tea, known as "red tea" (hong cha) in China, is the category which is fermented before baking; it is a later variety developed on the basis of the green tea. he best brands of black tea are Qihong of Anhui, Dianhong of Yunnan, Suhong of Jiangsu. Chuanhong of Sichuan and huhong of Hunan. 3) Wulong tea: This represents a variety half way between the green and the black teas, being made after partial fermentation. It is a specialty from the provinces on China's southeast coast: Fujian, Guangdong and Taiwan. 4) Compressed tea: This is the kind of tea which is compressed and hardened into a certain shape. It is good for transport and storage and is mainly supplied to the ethnic minorities living in the border areas of the country. As compressed tea is black in color in its commercial form. So it is also known in China as "black tea". 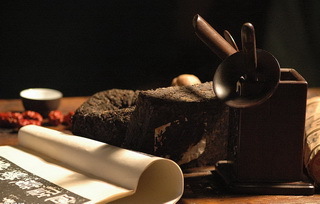 Most of the compressed tea is in the form of bricks; it is, therefore, generally called "brick tea", though it is sometimes also in the form of cakes and bowls. It is mainly produced in Hubei, Hunan, Sichuan and Yunnan provinces. 5) Scented tea: This kind of tea is made by mixing fragrant flowers in the tea leaves in the course of processing. The flowers commonly used for this purpose are jasmine and magnolia among others. 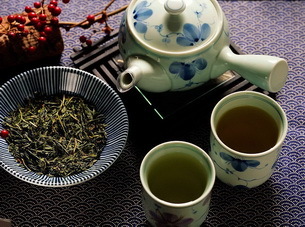 Jasmine tea is a well-known favorite with the northerners of China and with a growing number of foreigners. A new tea-plant must grow for five years before its leaves can be picked and, at 30 years of age, it will be too old to be productive. The trunk of the old plant must then be cut off to force new stems to grow out of the roots in the coming year. By repeated rehabilitations in this way, a plant may serve for about 100 years. For the fertilization of tea gardens. soya-bean cakes or other varieties of organic manure are generally used, and seldom chemical fertilizers. When pests are discovered, the affected plants will be removed to prevent their spread, and also to avoid the use of pesticides. The season of tea-picking depends on local climate and varies from area to area. On the shores of West Lake in Hangzhou, where the famous green tea Longjing (Dragon Well) comes from, picking starts from the end of March and lasts through October, altogether 20-30 times from the same plants at intervals of seven to ten days. With a longer interval, the quality of the tea will deteriorate. A skilled woman picker can only gather 600 grains (a little over a pound) of green tea leaves in a day. The new leaves must be parched in tea cauldrons This work, which used to be done manually, has been largely mechanized. 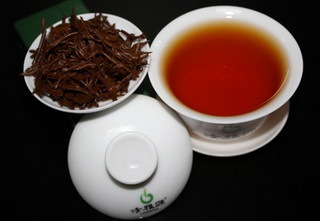 Top-grade Dragon well tea, however, still has to be stir-parched by hand, doing only 250 grams every half hour. The tea-cauldrons are heated electrically to a temperature of about 25 or 74 degree centigrade. It takes four pounds of fresh leaves to produce one pound of parched tea. 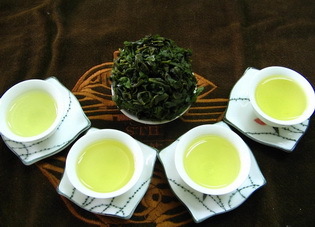 The best Dragon Well tea is gathered several days before Qingming (Pure Brightness, 5th solar term) when new twigs have just begun to grow and carry "one leaf and a bud" To make one kilogram (2.2 lbs) of finished tea, 60,000 tender leaves have to be plucked In the old days Dragon Well tea of this grade was meant solely for the imperial household; it was, therefore, known as "tribute tea". For the processes of grinding, parching, rolling, shaping and drying other grades of tea various machines have been developed and built, turning out about 100 kilograms of finished tea an hour and relieving the workers from much of their drudgery. As a sign of respect, in Chinese society, the younger generation shows respect to the older generation by offering a cup of tea. Inviting and paying for their elders to go to restaurants for tea is a traditional activity on holidays. The Chinese make serious apologies to others by pouring them tea. This act is taken as a sign of regret and submission. In the traditional Chinese marriage ceremony, both the bride and groom kneel in front of their parents and serve them tea as an expression of gratitude. The customary phrase spoken to the parents during this ritual can be translated as "Thank you for bringing us up. Now we are getting married. We owe it all to you." The parents will usually drink a small portion of the tea and then give the couple a red envelope, which symbolizes good luck. Tea has been one of the daily necessities in China since time immemorial. Countless numbers of people like to have their after meal cup of tea. In summer or warm climate, tea seems to dispel the heat and bring on instant cool together with a feeling of relaxation. For this reason, tea-houses abound in towns and market villages in South China and provide elderly retirees with the locales to meet and chat over a cup of tea. Medically, the tea leaf contains a number of chemicals, of which 20-30% is tannic acid, known for its anti-inflammatory and germicidal properties. It also contains an alkaloid I(5%, mainly caffeine), a stimulant for the nerve centre and the process of metabolism. Tea with the aromatics in it may help resolve meat and fat and thus promote digestion. It is, therefore, of special importance to people who live mainly on meat, like many of the ethnic minorities in China. A popular proverb among them says, "Rather go without salt for three days than without tea for a single day." Tea is also rich in various vitamins and, for smokers; it helps to discharge nicotine out of the system. After wining, strong tea may prove to be a sobering pick-me-up. The above, however, does not go to say that the stronger the tea, the more advantages it will yield. Too much tannic acid will affect the secretion of the gastric juice. Irritate the membrane of the stomach and cause indigestion or constipation. Strong tea taken just before bedtime will give rise to occasional insomnia. Constant drinking of over-strong tea may induce heart and blood-pressure disorders in some people, reduce the milk of a breast-feeding mother, and put a brown color on the teeth of young people. But it is not difficult to ward off these undesirable effects: just don't make your tea too strong. If you are a Chinese tea lover and would like to find out how tea is harvested, processed and turned from a simple leaf into the tea you love to drink, speak with Splendid China Tours NOW to plan your own private China Tea Tour! 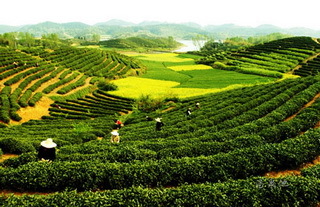 We will bring you to explore these lovely mountains and villages where great Chinese Tea is planted and produced! Check our Tea Tours to China 2015, please click HERE! China Tea Tours from the Tea Plant to the Teapot!